This week the Boagworld show features Stuart Frisby from booking.com and vision learning, a site that teaches us the power of well designed interfaces. This week Boagworld show features Stuart Frisby from Booking.com and Visionlearning, a site that teaches us the power of a well designed interface. Hello and welcome to the Boagworld show. Joining me as always is Marcus Lillington. Hello Marcus. Marcus Lillington: Hello, Paul. How are you? I’m very well. And today’s show, as always, is brought to you by headscape.co.uk and our shiny new site. Oh, I’m sorry, I always come out with jargon, I always forget the jargon. Marcus Lillington: Well, if you get it, we’re having shiny new site. Marcus Lillington: You nearly said shite then. I said site! Well, I’d get trouble with Ed and Dan if they heard me say that. Luckily they don’t listen to the podcast. So that’s not a problem. Marcus Lillington: Yes, it is very shiny and very lovely. It is. I like it. And do you know what’s really exciting, the most exciting bit of all is I have… I’m like a grown up now. I started using version control to edit the site. I know everyone else has been doing that since like 2006, but I’ve only – I hate version control systems. They never work for me. But this time I seem to have cracked it. I set it all up myself and it worked. I’m a grown up. Marcus Lillington: That’s good. Dan will be much happier than he was earlier. Was he stroppy that I had edited the live site over the weekend? Marcus Lillington: Might have been. I knew he would be. But I did it anyway. Well, so he wasn’t there at my beck and call. Some of us work through all weekends. Marcus Lillington: Well, you could have just phoned him. I think he would really appreciate it. He would have appreciated that just as much as me editing the live site, wouldn’t he? Marcus Lillington: Probably more so actually. I think so, yes. So anyway, so that’s really fun. It’s really – I don’t know whether you’re as pleased as I am, but I’m really chuffed with the way it’s come out. Marcus Lillington: We finally have the site that I wanted many years ago. It’s beautiful. It’s a real thing of beauty. And what I’ve got, which I’ve always wanted, is that combination of Boagworld and Headscape together. I think they sit so well together and the navigation idea that I came up with, to be honest, was genius obviously. Marcus Lillington: Did you really come up with? I did actually. That is the only contribution I really made to this site. It was the main navigation. But it wasn’t as genius as Ed’s very funky approach to case studies. Oh yes, it was Ed’s idea, but obviously it was Dan that made it happen. So you need to check it out, because it is very cool. I will put a link in the show notes to it, because essentially what they’ve done which is really clever, I’m not talking to you now Marcus, because you know this. I’m talking to the Boagworld listener, which is that instead of showing a static comp of the website what they’ve done instead is they’ve put it in an iFrame, which makes a lot of sense, but then what they’ve done is they’ve used CSS transforms in order to scale that down, so that it actually fits within the page. And then, just to make it even cooler, they’ve changed the size of the iFrame to show the site on different devices. So there is a desktop version, there is a tablet version, a tablet landscape and a mobile and a mobile landscape version and you can click through them and the site adapts because obviously it’s a responsive site that we’ve been building and you can see it in all different forms, it’s really clever and it’s just such a simple idea that I think its brilliant. Yes, sitting at Ed’s desk. Marcus Lillington: … It’s become relevant. There are some really nice touches about the design of the site and that’s one of them. Do you know I hadn’t even realized that’s what it was? That makes perfect sense. I like that. Marcus Lillington: Good isn’t it? It is good. So we… I’m sorry dear listener, we’re bit gushy and overexcited about it at the moment. It will pass, we will get used to it. Marcus Lillington: It will. Well, this, I wanted this site that goes back as far as when we worked with John Hicks on our branding, which was what I don’t know, six, seven, eight years ago. When you say you wanted this site, what do you mean by that? Marcus Lillington: He came up with many, many different mood boards, if you remember, and one of them was basically this design. And I was like – “I like that one, I like that one” at the time and we made the right choices to the mood board styling that we went for. But this was the style that I’ve always really liked. Oh, okay. Just what elements of the style, just the black and white? Marcus Lillington: Black and white focus on typography, focus on white space, all that kind of thing. Yes, which is just very appropriate now. The only big thing I need fixing is our search, because our search is crap. But we might have come up with a solution to that. There is a work-in-progress. Getting a decent search in WordPress is crap. All of them, basically I think we need to abandon WordPress plug-ins and those kinds of things. Go for something that spiders the site, like Google would spider it instead. I feel that’s going to probably work out better in the long run. But anyway that’s beside the point. Hey, I’ve been thinking about our next season. Because we’ve only got one episode of the season left. Marcus Lillington: Is that it? Yes, because then I’m going on a holiday. So yes, we’re recording one next Tuesday and then that’s done. So that will come out in the week of the 16th of June. So it will come out on the 20th of June. And then that will be it. So I’ve been thinking about next season. I’ve come up with a great idea. You’re going to love this. You are. I think some people I can tell you will disapprove with this. Andy Budd and Jeremy Keith will disapprove with this. Well, its season 10 we’re about to go into. Marcus Lillington: Oh, it’s the 10 best lists, isn’t it? Marcus Lillington: Oh yes, that’s fine. I think that will be brilliant. So each episode we have the 10 best of some thing or 10 tips for or we’re going to do a list season. Marcus Lillington: Yes, I’ve got no problem with that at all. Which I think would be great. Marcus Lillington: That will be absolutely fine, yes. I think it will be a lot of fun. Now Jeremy and Andy have been slightly opinionated in the past about list posts, because they’re lazy. List posts are lazy, but people like them because you can take them in very quickly and it would be really good as well. The reason I’m looking forward to doing this for the show is for the show notes, because essentially we can allow people to skip, so if they’re only interested in one point, they could – they can just scan the list of different things that we’re covering and then skip to the right part in the show, which would be really good. Of course it will mean that you will have to mark all of the different audio points for all 10 points. So your level of commitment to our listener is astounding. In this week show I seem to – we’ve seem to have lost nine of our listeners. I keep referring to the listener. So we did have 10 and now we’re down to 1. It must have been a bad week. They obviously don’t like the new site, do they? Marcus Lillington: How can you not like the new site, some people, well one person doesn’t like the video giffy thing. No, I don’t like that. Marcus Lillington: Yes, but you don’t count. No, but my opinion counts more than anyone else. Marcus Lillington: No, it doesn’t. Has Leigh persuaded you to keep it? Marcus Lillington: It’s just sort of stayed. We’ve only had… I’m not sure. Right. Dear listener, go along to headscape.co.uk and you will find an animated giffy thing behind the text. You have to then write to Marcus at boagworld.com with just one word, cool or not cool. Marcus Lillington: That’s three words. Oh, but the second one is two words. Cool or not. Marcus Lillington: The reason behind it, as I was saying earlier about having things that are relevant, the idea was to have… we wanted to have something graphical on the homepage, because it felt a little bit too stark without anything at the top of the homepage and it was like what we can have? And a picture of all of us was what we kind of felt was… that was the only thing that could work and then we started messing around, maybe we could have a video and we messed around with that and it’s like yes, okay. But then it was too big and we ended up with what we’ve ended up. And I don’t know if it’s a marmite thing. Some people seem to love it and some people seem to hate it. Marcus Lillington: That’s why I say I don’t know if it is because I’m all right with it. But I think if a lot of people came in and said oh no, that really – that’s really annoying or that doesn’t help in any way, I would be quite happy to change it. So I’m on the fence. I think we were right with the video. I think what we did wrong is we should have had a still image that loads and then when the video is… everything else in the page loads, when the video loads in the background, it starts playing. Marcus Lillington: Well, yes, we will just do that then. Well, that’s what I said, but nobody listened to me, as is always the case. You make it happen Marcus. They listen to you. Marcus Lillington: All right. Yes, they do sometimes, once in a while. I’m scared. I’m scared of Dan and Ed so I don’t like making suggestions, they just tell me off. Marcus Lillington: Yes, I have to kind of use my full sales mode to make things happen. Marcus Lillington: I’m the headmaster. Yes. Sounds good. So you like my idea for Season 10. That’s good. I probably should have discussed it with you before we started the podcast rather than live on air. Marcus Lillington: No, we never do that. No, we don’t. This is the only time we talk to one another. Marcus Lillington: At the moment. Mind you you’re going away with Chris for a few days, I’m quite envious, you’re going to get have a chat. It will be nice, although I have so much to do. So many places to go. My diary is just ridiculous. And then Chris this morning just crowbarred another trip up to Glasgow in. Marcus Lillington: Has he? When is that then? Yes, 25th of June, I think. Why are we discussing this on the podcast? This is ridiculous. Let’s move on. Marcus Lillington: Because it’s the only time we get talk to each other. I know. Let’s move on to the interview instead, shall we? Marcus Lillington: Good interview today? It’s a brilliant one. I’m really looking forward to it. So here it is. It’s a surprise. Normally I introduce them, but this week we will just have to find out the feature project is good as well. But I’m not going to tell you about that either. So here we go. Booking.com is consider by many to be one of the most persuasive ecommerce sites out there. So joining me today is Stuart Frisby. How are you Stuart? Stuart Frisby: Very good, Paul. How are you? I’m very well. It’s great to have you on the show. Thank you so much for giving up your time. So Stuart, as I understand it, you work for Booking.com, which I’m sure the vast majority of people that listening to the show have already heard of. But for those that haven’t can you give us a quick rundown of what the organization does, and then also what your role is? Stuart Frisby: Sure. Yes, this is a familiar spiel for me, I’m telling relatives all the time what it is actually I do for a living. So this is… it’s pretty well prepared. 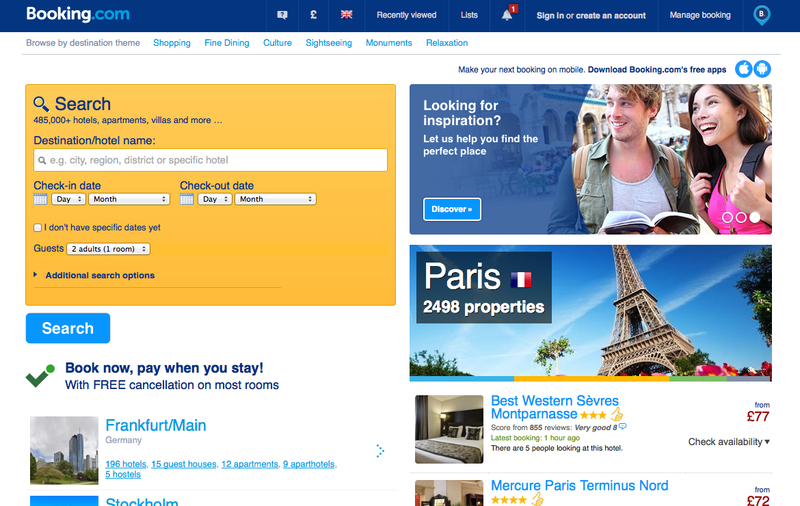 So Booking.com, we’re based in Amsterdam, we’re the world’s leading provider of accommodation online. So we’re a booking engine for hotels and various other things, which are hotels, igloos, apartments, tents, bedoin tents, yurts, all that kind of stuff. My role specifically, I’m the person responsible basically for growing our design team and taking a broad perspective on our platform from a design perspective and my title is nominally Principal Designer. Stuart Frisby: I’ve been with the company for three years based in our headquarters in Central Amsterdam. Previous to that I was doing agency work in New Zealand and before that living in Liverpool. Okay. So you sound like you’re from the U.K. originally? Stuart Frisby: I’m. I’m from Coventry, which was lovely before the war. But lots of reasons for me to go and explore which is why I’ve tried very hard to go and see a bit of the world since leaving there about 10 years ago. Yes, that sounds amazing. It sounds like you’ve had quite a journey? So tell us a little bit about what kind of things you’re doing on a day-to-day basis as Principal Designer? What’s… what will you be doing today for example? Stuart Frisby: Okay. Yes, that’s a good question. So maybe it helps a little bit to just explain the environment front end team, the team of people responsible for looking after the website and an array of mobile products. It’s about 200 people, amongst them there is maybe 40 or 50 designers. And so my role predominantly is taking a broad perspective on the product, being a conduit for critique and feedback on design stuff that’s going on. Taking a more medium or long-term perspective on the platform from a design point of view. I get involved in hiring and recruitment. So I talk to lots of people about the opportunities that we’ve got on offer here, today I will be talking to a candidate for a design position. He is flying in from China. That’s a pretty typical day for me. Okay. So I think that’s quite a big design team, isn’t it, for the platform, which explains the incredible attention to detail on your site. I mean you guys are well known for those little e-commerce enhancements that kind of nudge people into booking. You’ve got some great little persuaders that I absolutely love on the site. Stuart Frisby: Yes, so the reason our design can be so large is the approach we take to product development is one of testing stuff very thoroughly. So at any one time live on the platform we’ve 100s of things which we’re testing. And that means that there is lots of opportunities for designers to work independently, but also in collaboration with each other on independent features or design improvements. And as you point out the persuasive elements of e-commerce is something that we are a leader in, we’re probably a few years ahead of most of the e-commerce industry. The advantage of that market of course is that hotels are quite an expensive thing to buy and so we enjoy quite large margins which allows us to play around with quite a lot of stuff in the design perspective. Yes, absolutely. So talk about – you’ve just talked about one of the benefits there. But tell us some of the challenges you face working on a website like Booking.com? Stuart Frisby: Sure. So it’s a very complex product. It’s been around for a long time. I think that the site first launched in 1996. So it’s a bit of a dinosaur in internet terms. And with that comes all of the complexities of an old product, so with a code base which is hairy at times. We are dealing with a user base which is very diverse as well. So the site is in 41 languages, we support an enormous array of browsers and devices. So from a designer’s perspective that can be really challenging. If you take one tiny example of changing the copy on a button on the website, you have languages like Greek and Russian which can be very verbose and languages like Chinese and Japanese which are very concise and so for a designer working in that kind of environment, there is so many variables at play that you really – you have to kind of design in a much broader sense I think, and design with a lot more flexibility than I was previously able to ensure when I was working on websites which were just in English, which seems like a very simple challenge in retrospect, but at the time I didn’t think it was. I know. So it amazes. I used to back in the day work for IBM in their EMEA division, which is Middle East, Africa, Asia, it’s huge, basically everywhere except America. That’s a ridiculous number of languages and of course you have to deal with things like websites that read from right to left, rather than left to right and all kinds of peculiarities that… not to mention of course the cultural elements in terms of imagery and stuff like that. Stuart Frisby: Indeed yes. So I think the language stuff is kind of one variable that we deal with, but then, indeed, trying to understand the cultural aspects of those countries which will make them different and trying to address those markets individually is something that we work along. So we have teams dedicated to looking that platform from an Asian perspective, from a kind of localization perspective in all of our major markets and it sadly is not as simple as changing the language. Our right to left website is basically a complete flip of the entire website. Wow! That sounds incredible. Now one of the things I wanted to talk to you guys about is company culture, because in the book that I’ve just released, I talk a lot about company culture and how that is so vital in order to make a website successful. And one of your colleagues was at a conference when I was talking about this kind of stuff, and he came bounding up to me afterwards and said you must talk to Stuart about the culture that we have at Booking.com. It does all the things that you’ve been talking about. We really have embraced that way. So my curiosity has been piqued, and I want to know what you think it is about Booking.com that is culturally so friendly? Stuart Frisby: Okay. So the culture is pretty interesting. So we’re a Dutch company that in the early 2000s was bought by an American company Priceline.com. So we’re part of a group of companies that encompasses KAYAK and Rentalcars.com and a few others. But we’ve maintained a pretty Dutch culture, which is one of directness and also quite an outward looking one. So when I was talking about languages, that’s something that as a Dutch company we’re always very much looking outside of our own borders. I think the really interesting thing culturally for us, is that we started off as a very small company and became a very big company quite quickly. But what we’ve tried to do and what we continue to try to do is to keep some of that start-up ethos of moving quickly and breaking things to use the Facebook terminology. Stuart Frisby: So we’re massive, as I mentioned before, that there are maybe 200 of us committing code to the front-end on any one day. But we try and remain as agile and as light as possible, so all of those 200 people rollout to the entire website, which gives us somewhat of an impression of the fact that we hold on to some of those small company “stuff” things. I’m… sorry to interrupt you, but how do you practically do that? I mean, that just the idea of 200 people all committing to a website at the same time, how does that not turn into hell? Stuart Frisby: Some people would suggest that it is on the verge of that sometimes. It gets very complicated, but we have systems in place which allow us to roll forward and then roll back very quickly. If we deployed a website and something is wrong, we’re very quickly able to revert to the previous working position. But also the way that we kind of do product development is that teams are responsible for their areas of platform and when other people are working there, there is some coordination involved. But the essence of it is that we’re able to move quickly in both directions and it works out pretty well. I think if you look at our competitive landscape, some of our competitors rather than taking that approach will take their website down for one day per quarter to roll out a new set of features or changes. We think that doing it our way comes with some short-term costs, so we may break the website occasionally, but the accumulation of all those small breakages is much smaller than the cost of taking the website down for a day for example. Yes, absolutely. So what about management structure and company organization? How are you guys, are you fairly traditional, do you have departments and do you have a hierarchical management structure etcetera? Stuart Frisby: Yes, we do. But I think the structure on paper seems far more hierarchical than it is in practice. So if you take the position of a designer within a team, they work in a team of four or five people alongside some technical specialists and the product owner. That product owner reports to a director, who reports to the CEO. So it’s a very flat structure in that sense. Stuart Frisby: If you look across departments, that structure is multiplied out. So we’re very much involved in the customer facing side. But there is a huge organization within the business that’s focused on the supply sides and maintaining relationships with hotels or a big customer service department. So that structure changes a little bit depending on the department. In IT as we still call it, because we’re from the 90s, we try very hard to only introduce new layers in the structure when it’s absolutely necessary. And I think I’ve been there for three years, in that time we’ve added one extra layer in terms of the hierarchy. So it’s not something that we do lightly, and the more people we have who aren’t touching the product on a daily basis, the less contributing we believe them to be. So we like people who are hands on. Yes, absolutely. And I notice that you talked about how your small micro teams are made up of people with different disciplines. So it’s not like the coders are in one room and designers are in the other? Yes, absolutely. I mean, so you’ve spent what three years at this company, and before that you – it sounds like you worked in very different kind of environment, agency type environments, so making that transition, what was the most valuable lesson that you’ve learned from working on Booking.com? Stuart Frisby: Sure. Yes, this one is really easy. It’s one that I talk about a lot. So I used to go about being a designer with this assumption that being a designer was knowing how to do things, was knowing how to design, was knowing how to solve problems. And actually I think what I’ve come to learn in my three years at Booking.com is that being a designer is about being able to take a broad perspective on something and to come up with an idea, but not being married to that idea being successful. The way that we rollout features and changes to the site is that we test them and what we find is that we’re all mostly wrong. So I think there is a sense in the broader design community I think that the designer is the expert. The way that we see it within the company is that the designer is the person who facilitates testing new features, but isn’t necessarily correct. So that to me is the biggest change. I think it’s something that takes a lot of getting used to, and I think people joining the company have a bit of a tough on-boarding, going from that idea of being an expert to not actually knowing what works more than anybody else does. I think that’s a really good point. I also think it’s a thing that comes a little bit with age as well. The older I get the less sure I am about anything, which seems to be back to front really isn’t it. Because I’ve got more experience than I’ve ever had in my whole life and that experience tells me that I know less than I think I do. It’s weird. Stuart Frisby: Yes. I think you also start out with this… at least I as a designer started out with this assumption that there were things which are just globally true. So if I did something for one client, it was right for the next client. And even now on Booking.com if I can do something in one context and it works perfectly and users respond really well to it, but changing the context even slightly generally results in that feature not working. I can associate with that feeling, because so often you get clients, especially e-commerce clients seem to be the worst. They come along and they say I want it to be like Amazon. Well, just because it works for Amazon, doesn’t mean it will work for you. I mean the big one of course I can sense that is coming over the hill is that Google have removed their underlines on their links, on their websites, so now everybody has to remove their underlines, whether or not you’re Google. So this I think is a very, very good lesson that we need to learn that every situation is unique, even within an existing website. So do you have, it sounds like with the team that you’ve got, you probably don’t, but do you ever use external contractors? Stuart Frisby: Rarely. It’s an exception rather than a rule and for the reasons I discussed before, the complexities of the product and the uniqueness of the way that we work, it’s very difficult I think for a contractor to come in and hit the ground running. But we don’t have hard rules against it. If we need people to help us out on specific things, we will bring people in, so we occasionally hire external illustrators to help us on visual stuff. We augment some of our teams with specific skills to try and help us get through periods where we’re perhaps not as flush on having the right people as we’d like to be. But yes, I think it’s quite difficult for a contractor. Well, let’s flip it round, because this is a question I tend to ask a lot about what people look for in an external contractor, but instead I’m going to ask you so what is that you look for? You’re doing an interview later today, so what is it you’re going to be looking for in the people that you interview? Stuart Frisby: Sure. So there are kind of three predominant or three main kind of aspects that we look at in the interview process, craftsmanship, so the core technical skills, the ability to present recent design arguments, ability to stand up in front of your colleagues and explain your approach to something, being able to fix bugs in IE7, that kind of stuff is one set, but that’s not really enough. So in addition to that, we’ve 67 nationalities within the team, so being able to communicate effectively is really important. So communication is the second aspect that we look out really strongly. And then the third one is commercial aptitude. So designers here are given basically free reign to decide what it is they want to do with our product and so in order to make sure that we’re not changing the font family to Comic Sans on a whim, we like to bring in people who are able to think in the commercial mindset, so they’re not just thinking about solving a design problem, but they’re thinking about that problem in the context of the broader business in which we operate. So commercial aptitude, communication, craftsmanship are the three things. Got it. Yes, that works really well. I particularly like your attention to communication there. And communication in its broader sense, because like what you said when you got so many different nationalities it’s not just what language do you speak, it’s the cultural differences I’m guessing between all those different nationalities that could be a huge issue, if you don’t pick the right kind of people? Stuart Frisby: Very much so and… so I’m a native English speaker, and I like to think myself as being pretty good at English, but what I’ve noticed when joining the company, and the company having quite a Dutch culture where it’s very direct is that my inclination as an Englishmen is to be very indirect and almost saying the opposite of what you mean in a lot of circumstances. And so even as a native English speaker there is quite a lot of adaptation that you have to go through on the communication side in order to make sure that you’re not losing stuff in translation every time you’re explaining something to someone else. Absolutely. So one last question and I think this is going to possibly be an impossible question because of the way you’re structured. But what’s your big focus as an organization at the moment? What is it that you’re spending a lot of time in resources, thinking about? Stuart Frisby: Good question. And I won’t give too much detail, because I will probably end up in blue collar prison if I do that. But I will speculate a little bit about the industry and in the broader sense if that’s okay? Stuart Frisby: So I think the first part is if you take a look at the likes of Airbnb, Logify.com would be another great example. There is this move towards what I call the consumerization of selling accommodation. I think historically if you compare the tools which are available to consumers and the tools available to business, it’s been a massive gap in terms of the quality of user experience. I think Airbnb are really challenging that and for the established likes of Booking.com and Expedia and all of the other big guys in the industry I think it poses a really interesting challenge in terms of how we can take what we’ve done for consumers and do it for people who provide accommodation. I think that’s something that we will see a lot of progress on in the next 12 months. That’s really interesting, isn’t it? Because that’s a reoccurring thing that the Web seems to be doing, it seems to hit sector after sector and that sector suddenly that the gatekeepers, the people that used to control the sector are now being challenged in terms of the means of production and the means of promotion. So for example, where once you would have to go to a bank manager to get a loan, now you can use kickstarter, where once in order to be a professional musician you would have to be sign to a record label, now you can post stuff directly to iTunes yourself. So it’s this, like you say, commercialization where anybody has got the means of production and that the power is shifting in a sense. Stuart Frisby: Definitely. And it’s a challenge that we’ve kind of got our eyes very open to. And in our position as a market leader, it’s very easy to become complacent to some of these things and so the challenge for us is to not rest on our laurels and to really try and keep up and continue kind of setting the standards across our industry. Yes, absolutely. Absolutely brilliant. Thank you so much for your time Stuart. I think this is some really good stuff and its really interesting to see… Booking.com are a funny company compared to a lot of the ones that we’ve interviewed, because they were kind of… there is the internet trendy startup gang and then there is the kind of post… oh sorry, pre-internet gang and you’re kind of in the middle there, aren’t you, where you’re an early figure on the technology scene that you were back in 96 or whatever it was. So you’ve kind of got some of the elements of a traditional company, but a lot of that still thinking as an approach of internet digital companies. And it’s quite interesting to see where digital companies go over a long period of time like this. So really useful interview. Thank you very much. Stuart Frisby: You’re welcome. Pleasure to talk to you, Paul. There is something about me that would love to work on a big site like Booking.com. Marcus Lillington: So I found, because I was listening along, obviously I wasn’t part of this particular one, so I was listening along to it and what I’ve found myself doing is going to the Booking.com site and then starting looking at hotels, thinking about going on holiday. So if I worked there, all I’d be doing is oh, that’s a good deal. …seriously, they’re brain washing you. Whole articles have been written about just their hotels details page. Marcus Lillington: I have seriously been having a conversation with Caroline about going to Rome in the last 10 minutes. There, that’s the trouble. They’re so good. And they’ve these different scores related to 8.2 out of 10 and it’s rated very good and it’s based on 1,131 people think that this particular hotel is very good, oh I must go there then. Marcus Lillington: So it must be really good. It must be really good. Marcus Lillington: Yes, I will say it’s most very good, 8.2 out of 10 score from 1,020 reviews, well that’s it. The pictures look really nice as well. Exactly. And the pictures – and then they do this other thing where then it says when you look at the different suites it says things like “only two left”, but it doesn’t stop there. Sometimes I think I’m going from memory, but I think such things like “expected to sell out in the next two hours”, just to really put the pressure on. Marcus Lillington: Well and they’ve got ones, yes last chance, we’ve one room there, but also we’ve just sold the last space in this one. Oh, if only I had made a more impulsive decision there. Marcus Lillington: Yes, yes. I want that one. I will change the date then I can have it. Yes. It’s very, very clever. I’m very, very impressed by the site. And I often look through it and I’m quite heavily influenced. But as Stuart said, context is everything and just because it works, what works for them won’t necessarily work for other people. In fact, what works on one part of their site, won’t necessarily work on another and I love that whole thing he got talking about to me of as a designer all you’re doing is forming hypothesis. Yes and then testing the crap out of them. And that you can tell that this site has been tested to it within an inch of its life, can’t you? Marcus Lillington: Yes and I guess that’s the thing… I think a lot of designers would struggle to work there, because he was basically saying you have to kind of throw it all… you have to throw… sorry, I’m thinking out loud as ever… I think it’s right the designers are taught that they’re an expert, they are professional, they are hired to provide a skill. Which if you work for these guys, you have to kind of throw it out of the window and it’s all based on testing. Marcus Lillington: We’re designing the data. Yes. Well, I think – I don’t think that’s entirely fair, because there is still a skill in forming the idea that you’re going to test. Marcus Lillington: I suppose. Yes, you’ve got to come up with something to be tested. Yes. And I think that’s where the real designer skill comes in and its working out the best way, what are the different permutations, what are the different ways that we could go about doing this. So I still think it’s a highly skilled job, but it’s just there is a lot of pressure because you can’t make assumptions. You have to prove everything. And I think that’s… yes, it’s interesting. Marcus Lillington: I just noticed on the hotel listing here, one of these rooms has got sound proofing. So – yes okay. It’s dodgy isn’t it. Oh yes, we need a hotel with sound proofing. It’s so you get a good night’s sleep. You’ve got a dirty mind. I have another line that I liked, what Stuart said in this interview was that thing about if people are hands on with the product they’re seen as contributing less. So screw you Mr. Accounting department. Marcus Lillington: Yes, you don’t account. I don’t know. I think that might been Stuart’s particular bias, but that might be wrong. I’m sure if I spoke to someone from accounts they wouldn’t agree or HR. Marcus Lillington: Yes the whole thing before it would fall apart if it wasn’t for us, that’s what they’d say. Yes, of course they would. So great interview, really enjoyed that. I was… we were really lucky to get Stuart on the show and I really enjoyed hearing from him, but should we now move on and look at our featured project. Vision Learning is an award winning resource for teaching and learning science. Most importantly, it received my son’s seal of approval! So our featured project for the week is Visionlearning.com submitted by Craig Kauffman. Actually I think he did it in association with somebody else, but I can’t remember their names. They’re not important. Craig wrote in, so it’s Craig we love. Editors note: The site was designed by Carl Avidano. Marcus Lillington: Yes, thanks Craig. We love you Craig. So yes, go check out if you’ve got a browser handy, go check out Visionlearning.com. Marcus Lillington: I’m doing it. So the reason I picked this one, if I’m honest, is because it was a science site that provides, essentially what they provide is free digital resources for teaching and learning science, which as somebody that has a son who is obsessed with science and who is home schooled, this was perfect for me. So I actually got my wife and my child in to assess this site. Craig just so you know, we’ve done real useability testing on the site with real potential users and I’m glad to tell you Craig that it passed with flying colors. They were both very impressed. So there you go. So should we talk about it? So let’s talk about the site. 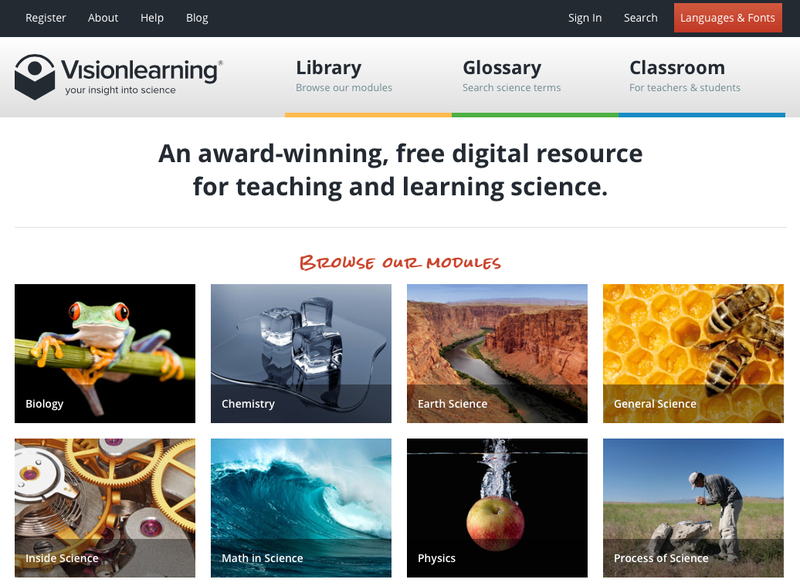 So basically it’s got loads of free digital resources for teaching and learning science. What I love really about the site is it’s got this very clear, clean, easy to use interface. Doesn’t try and be too clever, but it’s still really attractively designed and well put together and it’s got a really simple structure to it. Especially as we do loads of work with universities and they like to make things complicated, universities. Well this site has got modules that are organized in subject areas, as simple as that. So if you’re interested in physics as my son is, you click into physics, then there are a whole load of modules on different elements of physics and you click on one of those modules and in you go and you get all this useful cool information. Marcus Lillington: I’m sorry, I am giggling away because I’m clicking around the site and the bottom of the page, there is an ad from Booking.com for hotels in Rome. That’s just you just went to Booking.com, didn’t you? Marcus Lillington: Yes. They will phone in a minute. Marcus Lillington: Okay. Into chemistry. Marcus Lillington: I like chemistry. So that’s the subject area and then click into one of the modules within chemistry. Marcus Lillington: The periodic table of elements which is such an amazing thing. Marcus Lillington: Yes, I’m here. I’m here. And you see there’s loads of words that are underlined green, right? So rollover one of them. Marcus Lillington: There are lots of green words, not underlined. Oh, glossary term, Russian inventor and chemist born in Tobolsk, Siberia. Marcus Lillington: How does that work on an iPad? That’s a really good question. Perhaps it doesn’t. Yes, it will just be a click. Marcus Lillington: You double click and then, yes. Yes, it will come up and then click on the background it will go away. Well that’s how I would do it. I can’t be sure, I’d have to actually check whether he has done that. Which would be a little extreme just to test that. Marcus Lillington: Yes, we can carry on the interview. The interview, the podcast then. Yes. So there may be a small break at this point. We will keep recording. So interestingly, that is an idea I wrote about in 2010 and I will put link in the show notes of how to deal with glossaries. And that’s exactly the idea that I suggested. Marcus Lillington: I remember you saying that I like the language in the display font, Default and OpenDyslexic, that’s good. Oh, where do you see that? Marcus Lillington: Big red button, up top right. Oh, and it’s got something… Oh, that’s nice. So you can change it, so it’s… hey it uses that special dyslexic font. That’s really cool. That’s just… oh, I love it. Craig you rock. Although it’s really annoying if you’re not dyslexic, so I’m going to turn it back to the default. So there we go. That’s really cool. Have you… in case people don’t know about the Dyslexic font, do go and check it out on that website. So essentially Dyslexic font is designed, I think it’s designed so the bottom of each letter is heavier. That’s what it looks like to me as well, which apparently means it doesn’t jump around visually so much for dyslexic people and makes it easier to read, which is really cool. It’s an open Dyslexic font if you want to Google that and find out more about it. So yes, what else do I like about this site, I love the glossary terms, I also like, the other thing I like about it as you go through some of the modules, not all of them, partway through it, it asks you a simple question based on what you just read in order to see whether you have taken in that idea or not. And then also with each module there is also a quiz alongside it, so once you’ve, I’ve got stuck on open dyslexic now, we will go back. It’s not remembering my cookie settings. So yes, and then you go to the quiz and you can go through and you can see if you learn everything properly which is really cool. I like that. And it’s got an amazing set of resources with each module, so there is all kinds of additional resources of information and it goes off to Wikipedia articles and all that kind of stuff which is really cool as well. And what they’ve done here, because you think well they’ve put so much work into it, where is the return so to speak. But the return is that off the back of it they’re selling – they’re giving away this content for free and then they’re up selling books and courses and things like that off of the back of it, which is brilliant. And it’s a really responsive site, which is great, and really my only criticism of it is that some of their videos they’ve got are just buried under links. So I think it would be much better to embed them in the page, because the first thing my son thought when he looked at it is there aren’t any videos. And there actually are videos, but they pop up when you click on them as an overlay. Marcus Lillington: I’ve just taken a test in atomic theory and got 8 out of 12. Marcus Lillington: Without reading any of the stuff. See I’m just clever, Paul. Marcus Lillington: Oh no, I feel great now. You go with that. You go with that feeling. The other lesson I think we can learn from this one is that interaction helps to reinforce retention. In other words, what they have done because that sounded very fancy, didn’t it? Because you liked that, interaction reinforces retention. Marcus Lillington: I just thought you read that out of a book somewhere. No, I made it up by my own head. So basically what I’m getting at there is that if you interact with something in some way, it helps you to remember it. So in their case, that’s why they have these little quizzes and stuff like that, because if you do the quiz that helps you remember the fact, okay. Because it forces you to interact and to recall the information which will help you retain it on a longer term. Now that same principle can be applied to any site. If for example, you encourage people to comment on one of your blog posts, then they are more likely to remember that blog post over a longer period of time. And that can be used as well as a way of getting you to remember a brand or anything. If you start interacting with the brand, you’re more likely to remember the brand. And then the final lesson I think we can learn is the importance of explaining unfamiliar terms. I am fed up with sites that use industry jargon or that kind of stuff because, oh, well everybody knows it. Well, I’m sorry not everybody does know it. For a start, some people come into your site might not speak English as their first language. Other people might have a cognitive disability like dyslexia, which means that they might struggle to understand some terminology or it might be that they’re just new to your sector and so don’t understand some of the terminology. So you need to ideally remove that complicated terminology, but if you can’t do that, you need to be doing things like the glossary of terms that these guys have done. So good on them for putting that level of attention to detail, and I think really that’s it from me. That sums up this site, attention to detail. It’s in everything they’ve done and I think it really shines as a result. Marcus Lillington: I think so too. It’s very good. It even gets Marcus’s seal of approval. So that’s good. So there we go, check out Visionlearning.com. And good job Craig and team. That was a brilliant site and you should be very proud. Marcus? Do we have to do a job? Marcus Lillington: I don’t want to have to do a job, do I? We do, it’s to be honest your jokes are like work to me. Marcus Lillington: Well, this week Paul I need you to help me out. Oh god, this is going to end well. Marcus Lillington: … at a particular point in the joke. No, no, not yet. Marcus Lillington: It’s perfect. Well let’s do the joke. I don’t understand. Can you explain the joke to me. Marcus Lillington: I’d say Paul you’re drunk. Yes, but they were whales? Marcus Lillington: Yes, but they were in a bar. Well, that in itself is – you know I don’t get that one. Marcus Lillington: I thought that was quite good. No. No, that’s a complete failure. I’m embarrassed for you really, Marcus, over that one. Marcus Lillington: No, there are people falling around laughing and they’re embarrassed for you, but you’re feeling embarrassed. The fact that you dragged me into that embarrassment of the joke and made me make stupid whale noises, is that? In fact, to be honest my whale noise was the best part of that joke. Marcus Lillington: In your mind. Always in my mind, everything is in my mind. Marcus Lillington: All right. Let’s move on quickly. Marcus Lillington: Yes, we’re done. I think that we’re just going to leave it hanging on that joke to be honest. Marcus Lillington: Which is fine, I can live with that. All right. So we will be back next week for the last episode of Season 9. But start thinking about what top 10 lists we should be doing for Season 10, because I would love to hear your suggestions. You can send them to paul@boagworld.com and don’t forget to send Marcus an email at marcus@boagworld.com saying whether the video on the Headscape homepage is cool or not cool. Like the wall on Top Gear. Marcus Lillington: They used to. Okay. All right. Well, that’s it. Thank you very much for listening and talk to you again next week.